Does one have to keep the printed e-Visa on which the immigration agent wrote the visa expiry date? Upon entering India with an e-Visa (formerly known as tourist visa), the immigration agent writes the expiry date of the visa on the printed e-Visa (not the one on the passport, but the one we're supposed to print from the e-visa website). Does one have to keep the printed e-Visa on which the immigration agent wrote the visa expiry date? When I was in India, they didn't write on my evisa. The passport stamp will provide the exact same information you described. However, you need to keep your visa with you wherever you go for the full extent of your stay which may be up to 60 days. After you arrive home you are free to discard your visa. Just save your visa number and the dates of travel in case you want to visit India again because you will need that information for the application process. Yes, definitely. It is a document that proves you are within the period of time allowed. Not the answer you're looking for? Browse other questions tagged visas india or ask your own question. Do all of the Emirates in the UAE have the same visa policy for Indian citizens, or does it vary? 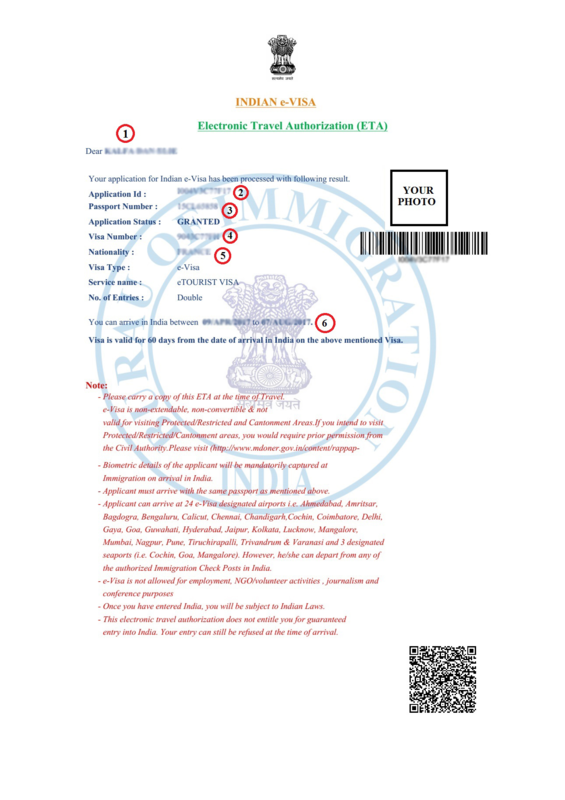 Indian visa registration requirements - stay duration or visa duration? Indian e-visa: Is all I need a print out of the email? Can I apply for a second Indian-Tourist Visa? Is there any time gap needed? Is it possible to get a new Indian evisa despite valid prior tourist visa in now-expired US passport? Tier 4 visa start date or UK Immigration law? When flying back from India to the US with eVisa + green card, does one have to take any action immigration-wise before the flight?